In my last post, I mentioned that we had a cool and rainy May. June started out with a bang and we had our first 90+ day on Tuesday. Yesterday took the cake though, with severe thunderstorms, an hour of continuous lightning and thunder and a nearby tornado. After I got my diagnosis, I started meditating once (sometimes twice) a day. I’ve been enjoying this – it’s lowered my blood pressure – but I felt I needed to go beyond what I’ve been doing. I decided to take a 4 week meditation class at Eldorado Mountain Yoga Ashram, where Diana has done her training. The ashram is in a beautiful setting at the mouth of Eldorado Canyon with a sweeping view of the plains to the east. When I came out of my first class yesterday evening, I could see a towering cumulonimbus cloud to the north and thought, “That’s an impressive storm. Somebody’s going to get hit hard!” On my way home, I went through some patches of rain and hail, but as I neared home, I could see that it was very dark to the north where the storm was. As I was heading into Longmont, I passed lines of people standing on the sidewalk looking at a cloud to the north. To me, it was a scud cloud and I was laughing because I thought they all thought it was a tornado (it did have a sort of conical shape, but was horizontal, not vertical). There were people along the street for about a 1/2 mile, all with their cell phones taking pictures of the cloud. Little did I know that there really was a tornado an hour before and these people had been out there watching it. 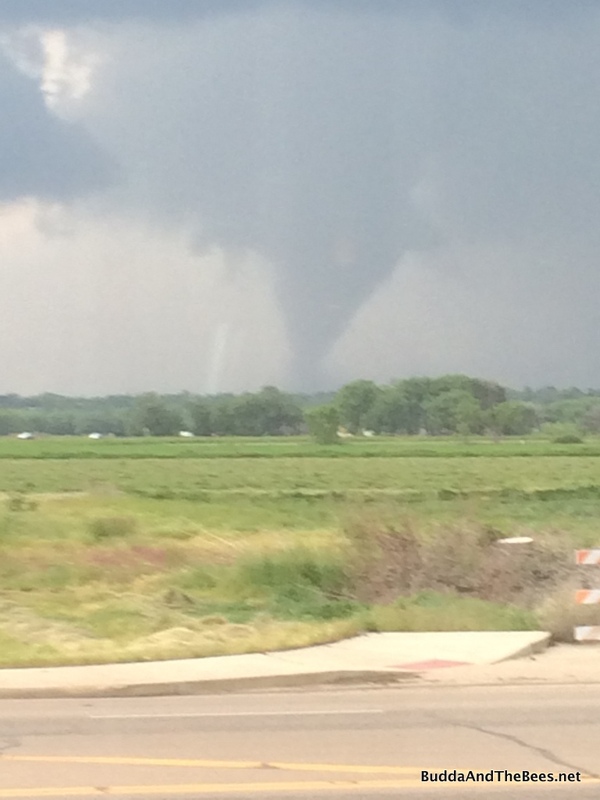 My son took the picture below from his work which is along this stretch of road – the tornado was about 8 miles to the north. Fortunately, there were no deaths from the tornado, but a couple dozen homes were damaged and there was hail and flood damage in the town of Lyons which was devastated during the 2013 flood. I stopped at a gas station to fill up and while I was there, it started hailing pretty good with marble sized hail. I learned a good lesson – if you are out driving around and there’s hail, pull into a gas station. They have a big canopy to protect your car. While I was waiting for the hail to stop, a Prius (the official car of Boulder) popped in to do just that. When I got home, I looked up at the sky and saw something unusual – the clouds were moving from east to west – not the normal west to east. That was not a good sign since that meant storms were moving towards us, not away. It was a pretty turbulent sky and pretty soon the emergency sirens went off so it was off to the basement. We took the opportunity to watch an episode of “House of Cards” while we waited out the storm. This morning, I was all set to do an inspection of Sarah’s bees around 11 am. At about 10 am, it started raining again, so I scrapped that and went to my favorite Mexican restaurant (Efrain’s) to celebrate my last treatment with some friends. On my way back, the skies had cleared, so I checked with Sarah and we decided to do the inspection this afternoon. Sarah’s grandson was visiting and I had brought an extra bee jacket, so he joined in to help for a little while (at least until he absconded). We filled up the sugar water one last time and went through all the combs to make sure they were being built straight. This hive has a side entrance which is different from my other hives. Since it doesn’t have a landing board, I don’t see as much activity in front of the entrance holes like I do with the others. But they seem to know how to go in and out and that’s all that matters. 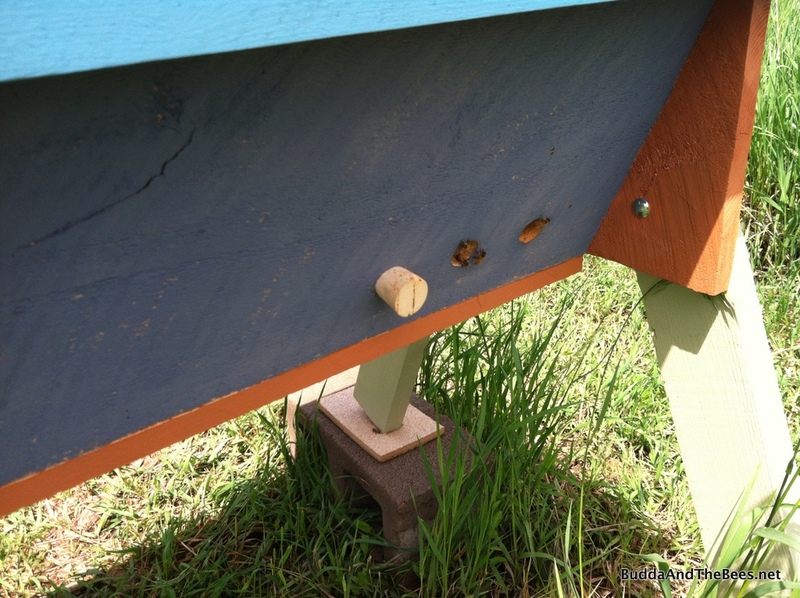 The one thing I’ve noticed is that since the holes don’t go right to the bottom of the hive and that I don’t have a screened bottom in this one, there is a lot more detritus on the bottom board. They shredded the manila folder that was holding the fondant a few weeks ago and that debris is still there. Sarah’s queen is doing great – she seems to be laying well. The workers are building out comb nicely (9 out of 12 bars so far) and they are all straight. We rearranged some smaller combs in between the larger ones to keep them building straight. There were a bunch of drones (like the one in the middle of the picture above) which are easy to mistake for the queen, as Sarah found out today. 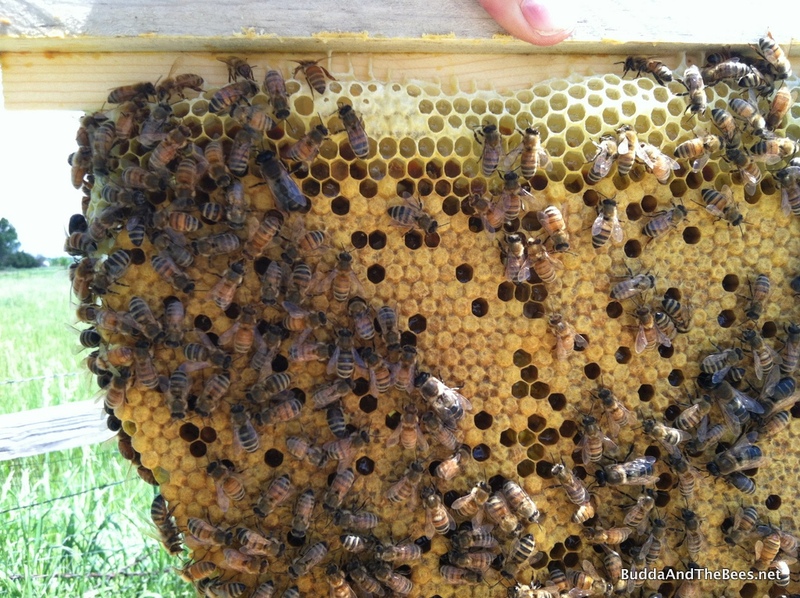 We did find the queen and tried to get a picture, but she was very shy and hiding up along the top of the comb, so none of the pictures came out well. While we were attempting to photograph her, she fell off the comb and luckily onto the top of the bars and not into the grass. We nudged her back in and gave a sigh of relief. Note to self – don’t spend too much time trying to take a picture of the queen – you might lose her. 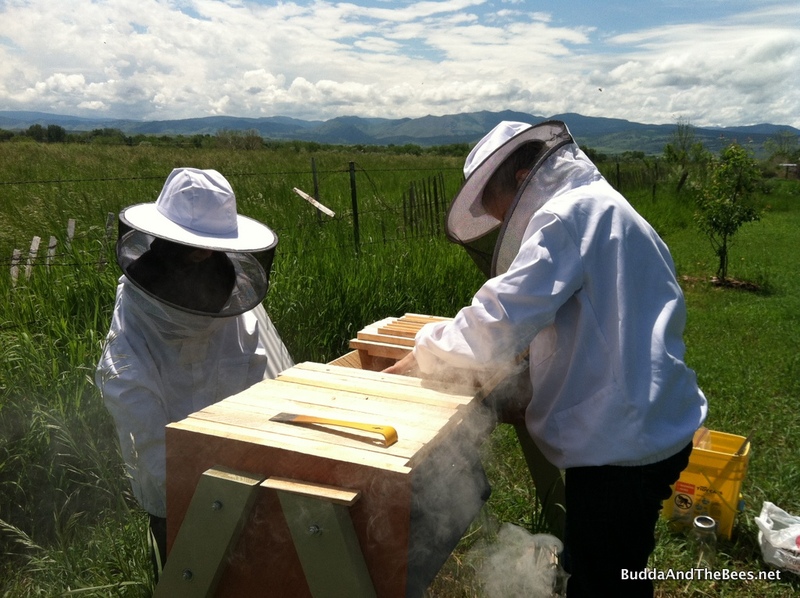 Tomorrow, the Boulder County Beekeepers Association is sponsoring a hive tour where we’ll look into hives at different locations. It promises to be a great learning experience – that is, if the weather holds out! Congratulations on your last treatment! Whoo hoo! Hope all of your follow-up appointments bring you good news, too! Wow! I’ve learned so much about weather in this post. Taking refuge under gas station canopies was a good tip. And I won’t even tell you how much time I spent reading about scud clouds. Had never even heard of such a thing before. Glad to hear that nobody was injured. Having lived in places prone to hurricanes and typhoons, my great takeaway has been — Things can always be replaced. People can’t. Enjoy your hive tours today! Sounds fun!